This book is beautifully straightforward, deeply honest and consistently profound. 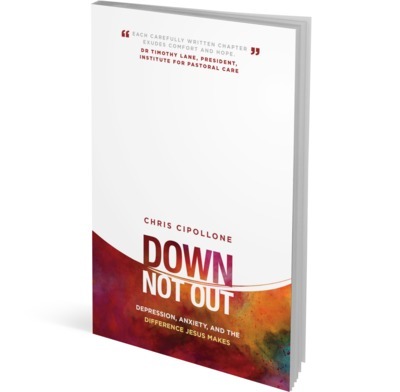 Chris Cipollone not only gives us a gentle yet compelling insight into the world of depression and anxiety, but consistently and winsomely points us to the Lord Jesus Christ, in whom real and ultimate answers are to be found. It may not take long to read this book, but the time invested will change the way you think about and respond to mental-health issues, whether in your own life, your family or the church. Chris "gets" mental illness. He has been in the dark places and openly shares his personal experience. We hear of the help that can be gained from medical and psychological treatments and the difference that a supportive community can make. But with a pastor’s heart, Chris’ main aim is to speak biblical truth into this difficult context—to gently correct false patterns of thinking and feeling, and above all, to point the reader to the joy and refreshment that is found in knowing that our acceptance, security and hope depend upon God’s unchanging love, not the quality of our mental health. Anxiety and depression are two of the most common struggles according to statistics. Some say 20% of the population for each. Given the amount of uncertainty and tragedy in our world, this is not surprising. But what are we to do with this reality? Do the Scriptures provide any hope for us? With compassion, clarity and humility, Chris walks the reader through a refreshing look at how God's grace in Christ is the most important antidote for anxiety and depression. As I read "Down, Not Out," I was personally encouraged. I found myself growing in compassion for so many people I know who struggle in significant ways. Chris is realistic as he captures the multi-dimensional aspects of anxiety and depression and cautions us against simplistic quick-fixes. Rather, he offers a personal, gracious God who walks with us, encourages us, and provides hope and comfort along the path. Each carefully written chapter exudes comfort and hope. I can't think of anyone who doesn't need that! I found this book easy to read. The chapters are only a few pages long, and they don't end with a massive list of questions to think about, just a short reflection. It's gentle and encouraging - running through it is a theme of "This is me - and God is there with me." It's positive (but realistic) about the value of medical and psychological treatments. It offers hope for relief from depression, and also hope in God in the deepest pit. A very honest look at depression in believers and also helpful for carers, but I'd like someone to address the problem of dealing with a lapsed believer, who suffers from depression but is not ready for such a Bible-based approach. I think it's wonderful that Chris Cipollone stresses that the believer's worth is based on Christ and not on their own perceived sense of self-worth or worthlessness, but where does this leave the person who has lost their faith? I bought two copies, one for my son, but didn't give it to him as I felt it was inappropriate in his case. Very good tool for those beginning to grapple with depression and anxiety. Straightforward and easy to read. Very sensitive to the potential reactions of sufferers. Very balanced on the sources of help available. Bible focussed and God honouring. Brilliant! God honouring, reality respecting, personal and powerful. I bought two copies and gave them away before I even finished reading it. Will buy and give away more too! Depression and anxiety are rampant. We know this because they disrupt family, friend, office, pew and pulpit. Here is finally an accessible and gritty Christian response that is honest and practical. Cipollone engages with the subject from his own experience, speaking into what many sufferers find inexpressible. But he also addresses the carer - which is imperative since sufferers just want to be understood by those close to them. And Cipollone handles Scripture beautifully and powerfully.